The Choice 2007 – present. One of Britain's most successful corporate function bands whose previous drummers include Gavin Harrison. John The Drum School 2010 – present. 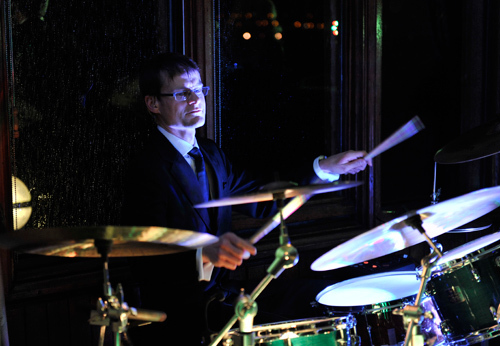 Senior Instructor and Sight-Reading Specialist at Britain’s best boutique drum school. Fist Full of Broken Wands and Cinemagic, Bloomsbury theatre with Tim Vine. Wild Party, Riverside Studios, Hammersmith. Over 100 regional theatre shows; Big Bands (inc. Mike Smith Orchestra); Brass Bands (inc. Grimethorpe Coliiery); Jazz (inc. Butch Thomas – Sting, Jaco Pastorious etc. ); Panto (with stars of Eastenders and Coronation St.); Cabaret (Inc. Mike Reid from Eastenders); Orchestras; Recording sessions.